Holy One, sacred energy of love, sinew that binds together the web of life, radical mystic called Jesus, pour yourself upon us in this time and place. Touch my mouth and all of our hearts that the words of about to be spoken and the words about to be heard might, somehow, be your word. Amen. On the exact opposite side of the city, through the Eastern gate comes a very different image. In place of war horses, there is a humble donkey. Absent armor and gold, leather and boots, comes Jesus and his palm-waving followers. Every bit of it is planned, staged and comes off beautifully. Where Pilate seeks to communicate the power and violence of Empire, Jesus’ is a procession of peasants seeking to proclaim the kin-dom of God. And unlike the sounds of Empire—clanking metal, creaking leather—the sounds of Jesus’ procession of those marginalized by Empire are those of swishing palm branches (a symbol of their rural, poor roots) and the crying of Hosanna, Hosanna! Blessed is the one who comes in the name of God! Blessed is the coming kin-dom of our ancestor David! Hosanna in the highest heaven! It is important to know that the word “hosanna” literally means, “O, save” or “save, I pray.” “Hosanna” is a cry of pain, a cry of hope and a cry of power. Hosanna means enough! 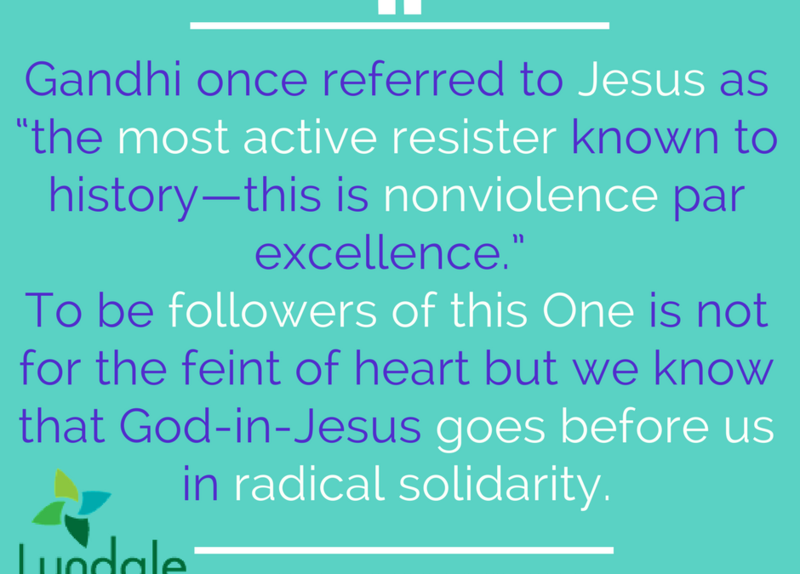 Gandhi once referred to Jesus as “the most active resister known to history—this is nonviolence par excellence.” And his procession into Jerusalem is a beautiful example of Jesus’ brilliance and wisdom because he knows what he is communicating and to whom. “From start to finish, Jesus uses symbolism from the prophet Zechariah. According to Zechariah, a king would be coming to Jerusalem (Zion) ‘humble, and riding on a colt, the foal of a donkey’ (9:9). In Mark, the reference to Zechariah is implicit. The rest of the Zechariah passage details what kind of king he will be: ‘He will cut off the chariot from Ephraim and the war-horse from Jerusalem; and the battle bow shall be cut off, and he shall command peace to the nations’ (9:10). This king, riding on a donkey, will banish war from the land—no more chariots, war-horses, or bows. Commanding peace to the nations, he will be a king of peace. It was October 1988 and nearly 30,000 people had died from AIDS. For some communities, an entire generation of gay men were infected and dying by the day. There was no treatment, there was no cure. Diagnosis was a near-certain death-sentence filled with stigma, pain and suffering. In response, the CDC, the FDA, local and federal governments had done next to nothing. And, a lot that they had done was to demonize and blame HIV+ people for the unfathomable fear, pain and suffering they were experiencing. Whenever any LGBTQ people gathered, the police dispatched to do crowd-control would don surgical gloves and, often, riot gear, to avoid touching people. It was a queer Hosanna, but an announcement of pain, hope and power, nonetheless. I was just young enough to have missed a lot of ACT-UP’s work, but I did get to march with one of their off-spring or inspired groups called Queer Nation. In the winter of 1991, as the first Bush Administration prepared for the first Gulf War with tactics not unlike Pilate and other leaders of Empire (sword-rattling, military build-up, threatening rhetoric), a group of about 200,000 entered DC, the present-day Jerusalem, and marched in protest. Our Hosanna’s were similarly queer and playful, but no less a plea. On Thursday, a group of high school students, including our own Aviva Meyerhoff, went to Minnesota’s Jerusalem, the State Capitol, to embody an opposition to gun violence and the inexplicable lack of gun reform laws in our state. The sights and sounds of their direct action were similarly plan-ful and similarly opposite of those they sought and seek to challenge. In place of the shouts of being armed with weapons, these students chose to be utterly silent; in place of menacing or threatening, they staged a die-in. As the business of the Capitol continued on, the video of their action shows the symbolically dead youth laying in front of the halls of power, eerily silent, for over half an hour. This morning, we mark another Palm Sunday. This morning, we wave palms as a symbolic gesture of our pledge to go into the centers of power through the East gate, to clothe ourselves with love and non-violence. This morning, we commit ourselves again to the sacred work of hearkening the kin-dom of God which, inevitably means resisting the kingdom of Empire (whether in Rome of Washington, DC or St. Paul, MN). It is a daunting task, really. It isn’t for the feint of heart. We know what is coming for Jesus as we mark his last Supper and crucifixion later this week. But it is precisely because we know that God-in-Jesus goes before us in radical solidarity that we are able to wave our palm branches and playfully poke fun at the militarized police and literally place our bodies on the floors of houses of power. And we know that our Hosannas are met with a powerful, loving and saving God.